Traveller | Tales to Astound! A few weeks ago I posted a link to a very smart post about pointcrawls from Anne at DIY & Dragons. The post goes into a lot more detail. But I think the value of pointcrawls might not be immediately obvious because we are trained to expect full terrain maps and full deck plans. But the fact is, a full deck plan of a starship might not be required for an evening of play for Traveller. Consider this: a pointcrawl could be made of a starship, showing all the chambers on board and the routes might be able to take from one chamber to another. There’s really no need to draw up full deck plans. And if one is focused on a “theater of the mind” presentation of the ship and onboard action to the Player rather than miniatures, a pointcrawl might actually make a lot more sense. 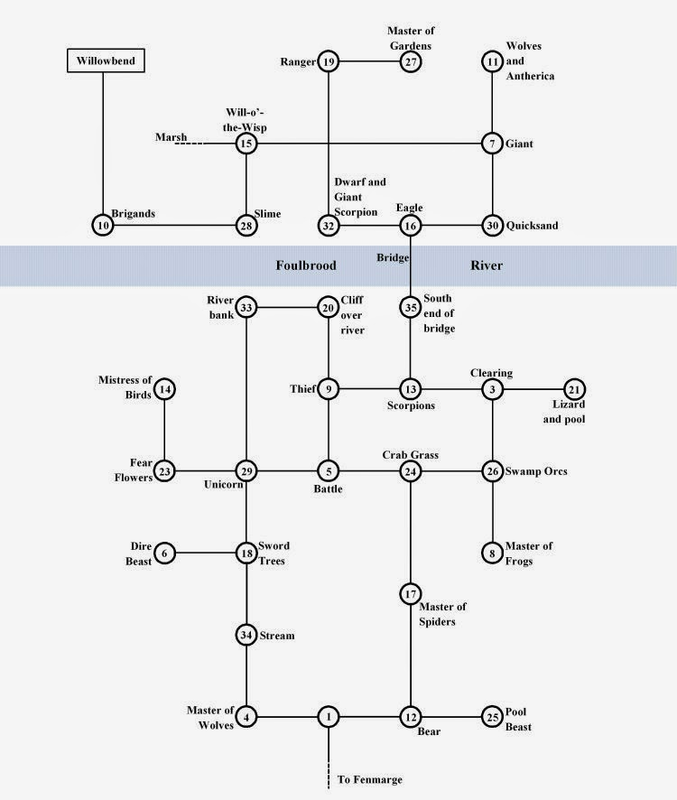 One need only glance down at the nodes and connections to see where the Player Character is in relation to other elements of the ship. Notes can be marked up next to the nodes (or within them) or however you want to roll. Here’s the pointcrawl of a 200 ton Type A Free Trader I just whipped up for this post. Notice that it tells me almost anything I’m going to need to describe what is happening on a ship. Most rooms are not going to be more than 8 meters across, which means that most combats will be at Close or Short range and sometimes stretch to Medium if the combats really make sure they’re firing at each other from one end of a longer room to another. Notice that cargo hold, even from end to end, falls within Medium range. (Notice too, that at certain points, where I thought it might matter, I noted the length or dimension of a room or corridor. One could do that with every room if one wanted to. Now, listen. We all have access to the deck plans of a 200 ton Free Trader. This illustration isn’t that big a deal, in part because we all have those plans and in part because the lower deck of a Free Trader isn’t really that complicated or big. But let’s say you needed to whip up a Corsair or any other kind of ship. The question is how much work do you really need to put into whipping up a new ship? Do you really need detailed deck plans to scale? Will your players ever notice if you don’t? Do you really need a details map of all the locations? Traveller is a tricky game in that the Player Characters can (and should) travel from world to world to world. This is, I think, one of the reasons the game can seem daunting to Referees (or would be Referees). If you’ve been raised on RPGs thinking you need full color maps of cities and continents draw to scale, the thought of having to create, say, 20 planets, along with all the cities, colonies, bases, and ancient ruins might seem overwhelming. And let’s be clear–IT IS OVERWHELMING!!! A given subector might have 20 planets. The idea that you, as the Referee will have all the details of those worlds mapped out and ready to go because the Players decide to have their characters pick up stakes and light out for another planet on a whim would drive anyone mad. This is supposed to be a fun hobby… not a full time job! And keep in mind: When I write all of this, I am assuming that the original Traveller rules were designed for improvised play… not railroaded plots. The Player Characters should be able to pick up stakes and head off to a new world on a whim, and new troubles should arrive on a whim as well. That’s what the game is about. Also keep in mind that the abstract range band system from the original Traveller rules. Marc Miller provided a solid, abstract system that could keep things moving along without getting bogged down in measuring every foot minutia. “Mapping” as we know it from early Dungeons & Dragons makes sense if you are underground, in an ill-lit environment, wondering if you’ll remember how to get out, while checking the map for empty gaps that might suggest there is a secret door you passed and missed earlier. You don’t need that level of mapping detail if you’re hangout out on a space station or taking a monorail from one city to another. The notion of pointcrawls fits right into the design philosophy of the original Traveller rules. 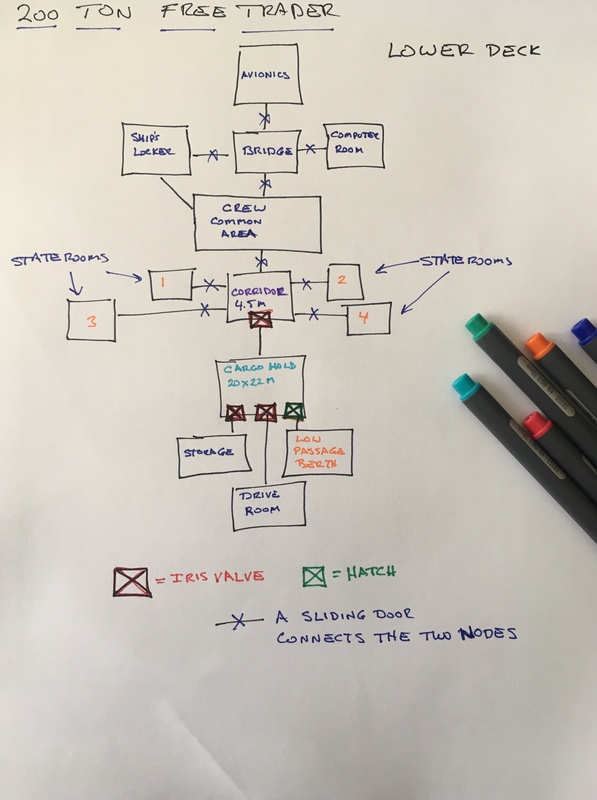 So, is it worth it to you to relive yourself of the responsibility of having to map out entire continents and space stations in order to give your players plenty of freedom, cut down on your prep time, and give yourself the confined to know you can handle whipping up whatever environment your players go to? Finally, Anne has promised to get to a post about “mini-crawls” very soon. But in the meantime she has a new post up with more examples of pointcrawling. This post on personal combat in Traveller Book 1 generated some great comments both in the comments section, but on several other sites across the Internet. Over at the G+ Classic Traveller community a solid conversation took place inspired by the post. Because we covered so many ideas and topics, and the nature of the conversation revealed people sorting out ideas (including myself) I thought I’d share the thread directly, allowing people to see how the ideas flowed. Also the group is great. And if you are interested in Classic Traveller you should check it out. Close combat with someone who has a clue with a firearm should be deadly in short order. I was part of the security response force aboard a submarine, and we stressed the importance of finding cover and concealment, and gaining surprise. +Michael Thompson I think something that can throw people off about the original Traveller combat rules is that they want RPG combat to feel like … well, RPG combat. They want lots of rounds, a slow ablative decay of hit points, and durable PCs that have time to take stock of a battle that is going south and change tactics accordingly. Marc Miller was a captain in the army and, believe, served in Nam. He wrote the rules to reflect how he saw a firefight would go. And so the game has rules that are brutal, quick, and dependent on the Players/PCs being smart long before the bullets start flying. Another excellent post. Something to consider is that, RAW, movement is normally completed before combat throws, so it would be possible (subject to Ref judgment) for the PC under fire to “evade into cover” before the combat throw is adjudicated, or maybe even “close range” from Short to Close. In the end I find CT combat fast, furious and fun, to steal a tag-line from another game. +Jeff R. Yes! I implied that in the post, but didn’t spell it out. I should probably fix that. At a past GenCon I ran a session in which a player, armed with a dagger, attacked a Stormtrooper in combat armor. After the dagger attack failed the trooper opened up on the player with his laser rifle and scored a hit. Everyone at the table knew that character was a goner. I picked up 5 dice, shook them, and dropped them in the middle of the table for everyone to see. 1, 1, 1, 1 and a 2. The player barely noticed the injury and the rest of his party toasted the trooper with their own weapons. Hitting your target is only the first part of the story. +Christopher Kubasik You’ve written a lot of good stuff on CT, but I think this might be the best article so far. CT and its combat always seemed to be a stumbling block with various groups when I was just getting into RPGs. But not the group I started with, of whom I and one other person out of about 8 were the only ones who didn’t have military and/or wargames experience. They had quite a different view from the rest of the roleplayers I gamed with. I think one of the key reminders you make is that PCs are awesome when it comes to firefights. A fact many forget. But, to steal a quote from one of my favourite action movies, they’re still ‘Touchable’. The fact is once you add in the DMs for range, armor, and bonus or penalties for high or low characteristics, the skill level often becomes a relatively insignificant part of the calculation to hit that 8+. Of course, most people in the world of Traveller have no combat training (not firing range training, but combat training) and so suffer the – 5 DM when using a weapon. In this regard, the PCs (with a default expertise of 0 or even skill levels) are definitely better than most folks — and so are awesome by comparison. That most people pick up the rules, focus only on the skill rankings of a PC, and miss all those DMs for range, armor, and characteristics is caused by many reasons. I suspect that one of them is that the combat DM matrixes split up the DMs for combat and thus makes it hard to see how the DMs will play out in a clear manner. A person sees those two matrixes, kind of gets hypnotized by all those numbers swimming around on the page that combine into something but it’s hard to see clearly unless you write it all out. This is one of the reasons I made the weapon cards: I wanted to be able to see clearly what each weapons was going to be able to do in different circumstances. And I wanted my players to be able to see it clearly, too. I want to think more about this because, of course, the NPC can move at the same time as well. He can be trying to cut the PC running for cover off, or try to get to a better flanking position if he sees the PC might try to evade into cover. This matters because of something I have never thought about before, but I’m going to give it some thought: Since all movement is simultaneous and all firing is simultaneous, when does the Referee decide what the PCs will do? How does he decide it? Does he write it down on paper before the PCs/Players declare movements? Does he let the PCs/Players declare first and then roll a die with two or three possibilities and randomly determine which action he takes, with different odds, perhaps for different actions? Again, I’ve never thought this through, but I do think it is worth thinking about, as it will determine how the Player feel the combat system works, if they’re enjoying it, and can help layer tension and excitement depending on how choices and actions are revealed. Back in the day, when playing RPG systems with simultaneous action in combat, I always had the players make their declarations. I would have some idea what the NPCs/monsters would do before they made their statements. Reasonable reaction to other statements was acceptable (like changing where you moved if an NPC or other player made a movement that might impact what you were doing). While I did not have exposure at that time to Free Kriegspiel, I think the way I handled simultaneous action fits well with that philosophy. I rarely had complaints from players so it must have felt natural to players (even ones with no previous wargaming experience). In fact, watching some play of Metagaming’s Melee turned me off of initiative systems (a fast enough character could move behind an opponent and strike from behind, without the opponent having any ability to turn as the guy was circling around him). This issue also made me wary of explicit facing (and in college, the Cold Iron game a friend developed that we played a lot had a further issue with facing and such. We usually used a hex grid for combat, but only 4 people could attack one opponent, so how do you resolve things when 6 opponents can fit around you on the board… In the end, I had written up a house rules document that laid out combat in more detail as our play developed more in the “board game” direction in the same vein as D&D 3.x. And with all of that in mind, for my Classic Traveller play, I will allow myself to be informed by Snapshot but I won’t directly use it, keeping combat more free form (but not entirely theater of the mind – I’m ok with using a map and a grid, but we won’t always count squares or hexes). +Christopher Kubasik I have to disagree with your statement “the skill level often becomes a relatively insignificant part of the calculation”. With the bell curve of two six sided dice being so short a single +1 DM from skill level can make all the difference. See my previous posting “The Power of ‘1’”. +Christopher Kubasik I don’t use a methodical decision tree, I just have an idea what the NPCs will do, go around the table asking for actions (e.g., “I dive for cover, shooting the nearest kidnapper”, “I spray my gauss rifle across the largest cluster of thugs”, etc.). The players don’t always use the “evade, close range, open range, stand” options when stating movement, though usually it’s obvious, or I ask for clarification. When it comes to combat throws I’ll sometimes decide, sometimes roll to see if shots went off before someone reached cover, depending on circumstances. I’ve resisted trying to add anything more formal, and so far it has worked just fine. Hi +Daniel M, I don’t think we are disagreeing. Please note that I’ve been banging the drum to get people to understand that a skill-1 is actually a big deal in Classic Traveller 2D6 bell curve for some time now. What I think we need to focus on in the statement you quoted is the word “relatively.” For example, someone shooting at a unarmored target at short range with an SMG is going to get a DM +5 for firing at target not wearing armor and a DM +3 for firing at a target at Short range. For armor and range DMs alone the shooter has racked up a DM +8. Obviously on a 2D6 bell curve this is an enormous advantage. So much so that on a Throw for an 8+ to hit the PC cannot miss. I’m not saying the SMG-1 rating the shooter poseses doesn’t matter. I’m saying that in the situation described above it matters relatively less than other DMs. In this case a PC is going to have the same odds of an effective hit whether they have SMG-1 or SMG-0. Which was the only point I was making. Skills matter, but they are not all that matters. But people, for whatever reason, really focus on the skills and their levels when reading the Classic Traveller rules. +Jeff R. Do the players find out what the NPCs are doing before or after they declare actions? (Or is it a mix of some kind?) That’s what I’m curious about. Because if you close range to get to melee and I open range with a firearm while you charge me you might get caught out in the open at short range and I get a shot off on you. That’s going to matter! And I agree with pretty much everything you and +Frank Filz have written about keeping it simple. So if you declare backing off to open range, and my guy is trying to close with you, then we look at relative movement rates (they may be the same) and you probably get a nice shot off. It’s also hard to judge these things in abstract scenario, once in play, we have more information to make an adjudication with. Yes. The part about relative movement rates I understand. I am trying to figure out the best order to decide/reveal the NPC’s choice to open range. If i’m the Referee it might not occur to me to have the NPC back up until the Player announces his character is going to charge. But if actions are simultaneous should I be making decisions based on foreknowledge of the PCs’ movements? If I’m the Player I might decide I don’t want to charge if the NPC is going to back up and leave me exposed to a shotgun blast at short range. It seems to me that a) when actions are announced and b) when characters are committed to actions matter. And I’m thinking that through. I see the issue: I run a loose game where the PCs are of heroic stamp, and they always get the benefit of the doubt. But I do decide what the NPCs are doing before asking the players, and if the NPC actions might change what the player wants to do I generally give them a chance (Saving Throw) to change, as long as the change isn’t too drastic. The NPCs never get that chance, since the story isn’t about them. +Christopher Kubasik Yea, totally. Players can make their statements of intent conditional which helps. If the player was trying to decide whether to break cover to close and the NPC was going to open range, I think either the NPC’s intent would be clear to the PC before breaking cover, or it would be more the case of the NPC backing up in reaction to the PC breaking cover. If it really became an issue, I’d possibly call for some kind of random throw to determine who gets to react to whom (note that many initiative systems actually leave the more reactive character committing first which can seem backwards – another reason to use common sense rather than a strict procedure). Again, I think in the moment of play, there would be more information than our cooked up scenario to help decide what happens. That doesn’t mean talking and theorizing isn’t helpful in opening our eyes to different ways to interpret the situations we face in play. +Frank Filz That all seems reasonable to me. I’m a big believer in “Let the fiction sort it out.” And my first post on this issue above suggests exactly what you suggest — if I’m not sure which way an NPC will go, I’d come up with a random die roll to determine a course of action. Whether this is “theorizing” I have no idea. (Well, that’s not true. I certainly wouldn’t consider it “theorizing.”) The rules offer no instruction on how to handle this stuff. And my thesis for the Out of the Box posts has been that many of us have been “trained” to play a certain way — and that Classic Traveller works from assumptions counter to most other RPGs. By naming specific issues at hand in apply the Classic Traveller rules the would-be Referee can visual and imagine ahead of time how the application of rules might work out. +Frank Filz When I think about the rules, I think I have many of the same issues as +Christopher Kubasik mentioned when it comes to “simultaneous”. Mainly because of my experience from other games where you have to write your moves so the declarations as well as resolutions are simultaneous. When I’m gaming it I realise it often has come down to more of what you and +Jeff R. describe: order often becomes obvious. And we’ve forgotten to “roll for initiative” because tho’ we initially started with Mongoose Traveller we seem to have ended up running pretty much CT. I think I’ve been overthinking it. And, this isn’t a war game. I think you’ve all helped me get a better idea on how to run CT combat. Thanks. 2. Wait to see what your opponent does, and then act. In either case, rules about movement and engagement model the consequences of your actions, and depending on your resources, your decision could affect the rest of the battle. A lot of this may seem abstract, but even on the 1:1 scale of CT, that’s what those bonuses for Tactics, Leader, and prior military experience model in the surprise roll. James from the James the Geek blog had the good fortune to play Traveller with Marc Miller at Gary Con X last weekend. After the game he sat and chat with the group of players, and with James individually for a bit as well. As a fan of Traveller James had a lot of questions about the game and put them to the man himself. He has posted the results of his impromptu interview. When Mr. Miller designed Traveller, he intended it to be a generic sci-fi roleplaying game system, in which we could play any science fiction game we wanted. The Third Imperium setting came later. Originally, there was no intention to publish anything except rules. He wanted players to use their imaginations and play in whatever world they wanted. The Imperium became the setting after a reviewer made a comment that he wouldn’t play a game that did not include a pre-defined setting. Marc implied that he didn’t want to play in one in which there was one. He said he had even written an article about it. I believe that the ‘fanzine’ may have been “Space Gamer”. Money. It’s come up here a couple of times, so I asked Miller how he envisioned money would work in Traveller. He said he never thought people would really be transporting money, like credit or even cash. Instead, he gave the example that on one world you would buy a cargo load of pigs. You would go to the next world and sell the pigs for a cargo load of turkeys and, hopefully, enough local currency to get supplies, fuel and repairs, and then move on, repeating the process. Personally, I think “Firefly” does a great job of demonstrating this in action. Of course, that still doesn’t answer how a ship gets paid off, and I didn’t ask. His favorite version of the game is still Classic Traveller. Yeah us! He loves the character creation system because the dice rolls give you interesting characters to play. He pointed out how, during the weekend, he had several PCs that were really just dumb, and it was fun to see how the players handled playing those characters. He mentioned that this is what made the game interesting, and gave exciting results. During the game our rolls mostly consisted of “roll under the attribute”. 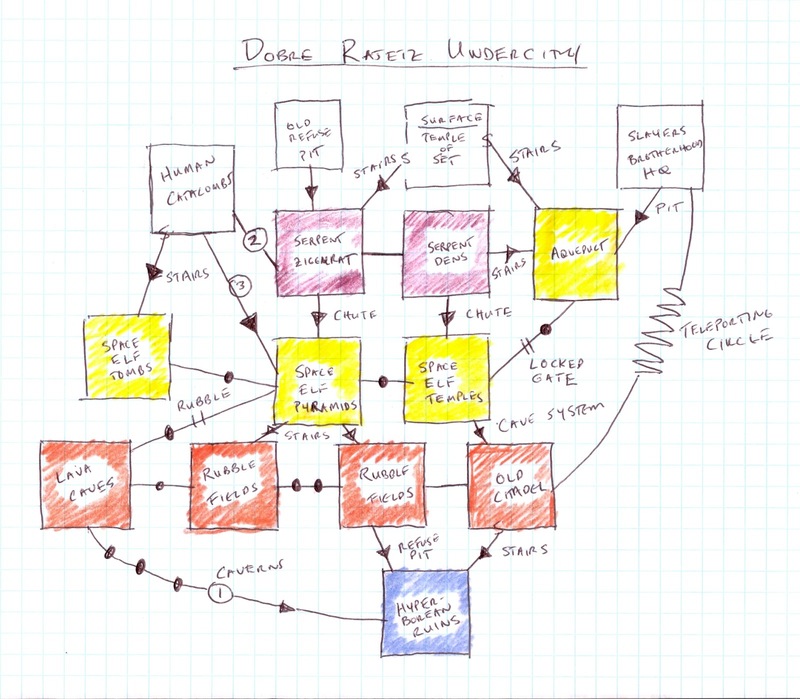 While he doesn’t play Traveller using lots of rules, he does like to play with systems. Just like many of us here who play with building starships, or worlds, or the merchant system. T5 is this way. He said “I always wanted a system that would make interesting aliens with 5 arms and stuff and I couldn’t figure out how to do it. Finally I did.” I haven’t read T5, but given how much fun I have personally had playing the games within the Traveller game, I may have to pick it up some time, just because. Now, there is little in the above that will surprise to the readers of the blog. I’ve been flogging these matters since the fall of 2015. The weird thing is how many people did not believe me when I pointed out that there was no Third Imperium in the original rules sets, how the game was designed for everyone to create their own settings, how the game is designed to mostly be a conversation between the Referee and the Players and the Referee falling back on the rules when required. Now, Miller has been making many of the statements above for decades–pointing out since 1981 that he assumed the rules found in the original boxed set would be the last Traveller material he would ever (or ever need to) publish. But despite actual interviews with the actual man who was actually there, the pushback against these bland facts was often crazy-fierce. In particular, the notion that Traveller is the Third Imperium and that if I wanted to address the rules and how to play the game I was somehow missing out on what Traveller actually is. Which leads to the most interesting point about Millers comments above. Miller states that Classic Traveller is his preferred version of Traveller. And the fact this is the edition he chooses to play at conventions gives lie to the notion that each iteration of Traveller is somehow an improvement or “advancement.” I bring this up because I have had had interactions with several people who consider Classic Traveller to be some sort of “introduction to Traveller” and really not worth much time when Traveller5 is around the corner. I have stated from the start of Traveller: Out of the Box series that I believe Classic Traveller works–and works great–as is and without needing to be “fixed” or “improved.” Later editions add more and more complex rules or endless efforts to simulate reality–and if that is what someone wants more power to them. But as an RPG game used in the playstyle of the 1970s I don’t think the game can be beat. 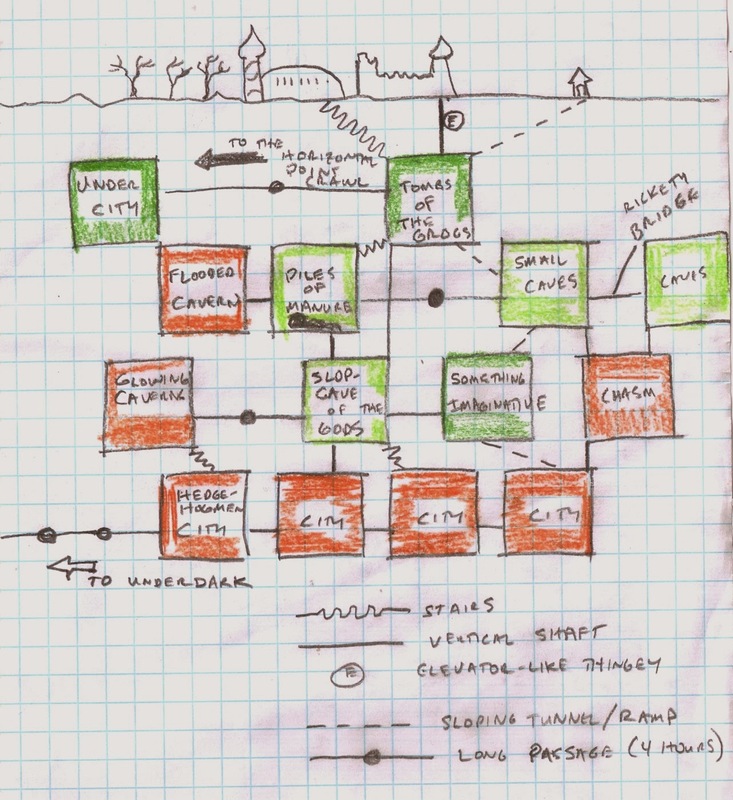 Which brings to Miller’s point that while he likes the challenge of game design, he doesn’t use the complex game designs he creates. He doesn’t use rules that have rules for everything. He instead uses the simple, straightforward, Referee-driven rules of Classic Traveller. I have a theory: Back in the 1970s GDW created a wonderful, light RPG rules set for playing Science-Fiction adventures in the far future. It provided a straightforward framework a Referee and Players could to play out countless kinds of settings and situations. For some settings and situations the Referee would have add rules, subtract rules, or simply ignore some rules–but that was part and parcel of the spirit and the letter of play in the mid-70s. After all, one could play a terrific and long campaign of Traveller on a single planet. If you never got around to using the cargo and passenger rules, that would be fine. The key is this: it was a framework for you to go do things with. The reason Miller didn’t think there would be need or demand for more Traveller products is because he assumed everyone would take the framework and go do what they wanted with it. But something unexpected happened. Rather than taking the framework and doing what they wanted with it, people who bought the little boxed set of Traveller rules wanted answers. GDW assumed you would provide the answers you wanted for your game, but in short time it became clear the people who bought the game wanted GDW to provide answers for them. And this was completely contrary to how GDW thought you would use the game–and should use the game. Take, for example, the laser pistol. Although it does not specifically mention them, Traveller provides all the information needed to enable a referee to create them, with a little mental effort. Since, as referee, we are running the world, we declare that a laser pistol should be to a laser carbine as a conventional pistol is to a conventional carbine. The above example indicates how the Traveller rules can be used to create something not present in the rules. We don’t have room to describe everything. With a little imagination, a little research, and a lot of thought, almost anything can be made compatible with Traveller. On some level, Wiseman’s reply to the review comes across as a little tetchy. On another, though, I find it reminiscent of the afterward [sic] of OD&D, where Gygax and Arneson ask the question “why have us do any more of your imagining for you?” That’s a sentiment that makes more and more sense to me as the years wear on, so it delighted me to see it expressed in the pages of JTAS so long ago. The questions never stopped coming. A great and vocal chorus demanded a half-dozen guys running a game company to nail down every possible application of the rules for Traveller as well as how an interstellar empire would work. All this despite the fact the game was designed for the Referee and Players to come up with their own setting and details for their own table. It is my belief then, that Miller has spent the last four decades, on and off, trying to come up with a rules set the will satisfy this choir of questions. A game so broad in its application (in other words: everything) that it could provide and answer to everything with the text of the rule book, whether it be about having a roll defined of every situation or a method of answering any question about the settings. And so we have Traveller5. Now, there are people who want games like Traveller5–and so I’m glad Miller is making this game for them. There is a need and desire for this product, and Miller is doing his damndest to deliver. But here is the important thing: Marc Miller doesn’t play Traveller5. He plays Classic Traveller. Traveller5 is for all the people who want a game that will provide all the answers for them, an audience that Miller wants to please, but he himself is not that audience. He built the game he wanted to play 40 years ago. He’s still enjoying it. Over at Tales of the Wizard Nebula, John Miskimen is putting together an original setting using Starter Traveller, along with Mayday, Snapshot, and Supplement 4: Citizens of the Imperium. AI created Jump Gates that even out to six months per parsec Jump. AI is very much a part of the setting. The very first AIs developed in The Deep Web almost a century ago, where they could develop and grow with controlled (by the AI) human interaction. When they emerged, they were more advanced than their designers and have lent limited aid to their creators, that which aids the AIs themselves as some would contend. Mankind has developed various technological breakthroughs with AI assistance, such as cloning, android creation, and improved robotics. Some speculate that this has only happened to better affect the merging of AI and biological life. Meanwhile, with the development of Jump Gates, various Mega-corporations have sponsored travel to the stars and created several colonies. Naturally, the Military has mirrored this endeavor, but in reality, it was the corporate world that conquered space travel. Private space travel is a luxury and not particularly commonplace. Star travel is dominated by majority trade operations and military applications. Some of you may know I made a set of weapon cards for the 1981 Classic Traveller. 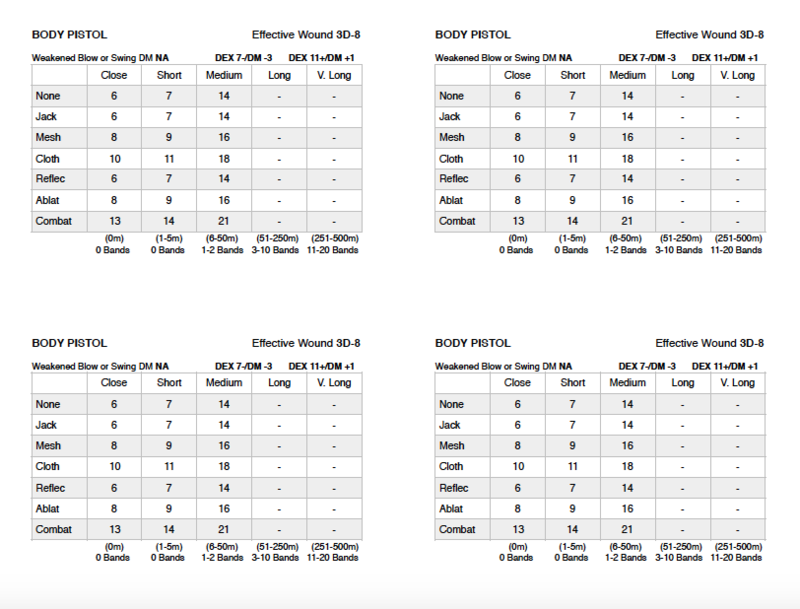 Each card lists a specific weapon, the +/-DMs for Strength or Dexterity, and a matrix that combines the DMs for range and armor from Book 1 into a single Throw number. 1. The DM for SMG against No Armor is +5. 5. The final numbers printed on the card represent what the Player needs to roll or better on 2D6. So: No armor, close range is DM +1, meaning the PC needs to roll a 7+. In this way, the Player only has to look down at the card and read the Throw number required. I now have a set of the cards for the 1977 edition of Traveller. The big difference is the damage values. In the 1981 edition of the game all damage values are whole dice (xD6). In the 1977 edition of the game some of the damage rolls are modified by a +/-DM (xD6 +/-y). In the notation above the character has a Blade-5 expertise and a DM +1 because of his Strength of 9+, and so he has a DM +6 when using blade. A character with melee weapon expertise can apply that expertise as a -DM to incoming melee attacks, thus the parry value of 5, for a DM -5 if someone attacks him with a melee weapon while he is defending with his Blade. As always, if you spot any errors let me know! If your Player Character fires a shotgun at a target wearing no armor who is standing 3 meters away from your character, you need to roll 2 or better on 2D6 to do effective damage. This means you don’t need to bother rolling to see if you do effective damage. You can simply pick up the damage dice and roll and find out what the damage is. For a lot of people this is a problem. “How can there not be a chance of a miss?” they ask. “I automatically hit?” It really rankles a lot of people. But I have come to believe this view is overstated as a problem. Not overstated as a fact, but as a problem. The fact is, the game rules suggest that yes, if you are trained in weaponry, and if you fire an automatic rifle, shotgun, or submachine gun at an unarmored target who is standing still 1-5 meters from you, you will, in fact, hit that target and deal damage. The person doing the shooting has been trained in the weapon. Characters who have no training in a weapon have a DM -5 to their Throw. Many NPCs will have training in one weapon, but suffer the DM -5 in other weapons. Per the rules, however, all Player Characters get an expertise of 0 in all weapons due to their training. PCs are the exception in this regard. Which means that the odds are not just a matter of weapon and armor. The skill-0 in all weapons means the PCs know what they are doing when handling a firearm to a much greater degree when compared to most other people. In my view, I assume that the skill levels of weapons are not simply going to the range and shooting at targets. The people who have skill-0 or above in weapons are people who are used to combat situations, know how to fire under stress and when bullets are flying, and have muscle memory that goes far beyond anything to do with shooting ranges or hunting. Anyone who does not suffer that DM -5 knows what they are doing in a gunfight. Thus, if a trained combatant fires at an unarmored opponent who is standing still at a range of 3 meters I believe it is reasonable to assume the target will suffer horrible damage. The base matrix values assume the target is standing still. May I suggest boldly that if you are at short range and unarmored and someone is shooting at you not do this? I am well aware that the DM -1 on the attack might not help at all. But here’s the fact: If you try to avoid someone firing at you with a shotgun or submachine gun at three meters, trying to rush out of the way might not help. In other case it will help… but just a little. The odds of the automatic rifle against an unarmored target at 1-5 meters moves from 100% to 97.2% to deal effective damage. Still horrible, of course. But what for goodness sake are you doing standing 3 meters from a man with an automatic rifle pointed out you who wants to kill you? At some point this is your fault. Meanwhile, if you are unarmored and out in the open at medium range (6-50 meters) even if you are evading, unless other circumstances intervene, you will be take damage from a man who knows what he’s doing with an automatic rifle. Cover and Concealment: Cover is any solid object between an attacker and defender capable of protecting the defender from a weapon attack. Concealment is any object that prevents viewing or sighting of the defender. Cover may also be concealment, concealment is not necessarily cover. Targets are considered under cover if they are behind a solid object which a shot cannot penetrate (such as a wall, rock, or heavy bulkhead). An individual under cover cannot be attacked; an individual in concealment cannot be attacked unless the attacker has some reason to shoot into the area. A target may be partially concealed by walls, objects, atmospheric conditions, or darkness. Targets are considered concealed if they cannot be viewed by an attacker. If fully concealed, a target cannot be attacked. Individuals who attack from cover become visible and may themselves be attacked; because they retain partial cover they are eligible for a defending DM of –4. Individuals who attack from concealment provide reason to believe they are present, and may be attacked; because they remain partially concealed, they are allowed a defending DM of –1. If you must shoot back from cover, sort out the best range you can. For example, with the DM -4 for anyone shooting at you as you shoot from cover, if you attack someone with an automatic rifle his odds of his doing effective damage against you drop from 100% to 72.2%. Still terrible you say? Guess what? You’re in a gunfight. Horrible things happen to people in close quarter gunfights. It’s a roleplaying game. The rules are designed to put the squeeze on anyone in a fight. The Classic Traveller rules are not design to be a tabletop milsim where were move little men around knowing some might be sacrificed for the greater good. We care about the guy we are playing. And if he’s unarmored and someone is coming after him with an automatic rifle it would behoove him to come up with some idea or plan which will let him get the hell out of there, get the drop on his assailant somehow, or otherwise turn the tables and increase his odds of survival. The point is that the Player or Players better come up with something to shift the situation around. Not because this is the way the world really works… but because this is the way science fiction adventure fiction (which is what Classic Traveller was built to emulate) works: The protagonist is in a really tight spot, the odds are against him, and he has to come up with something interesting to turn things around. That interesting part? That’s what makes the memorable moments. That’s what makes memorable game sessions. You want the screws turning against the characters to make them sweat and come up with something smart. WHY ARE YOU SHOOTING AT UNARMORED MEN? Do you need to kill them? (Because the system is going to let you kill them very easily. You are awesome after all.) But will they have friends or family who will come after you. Is killing actually the best plan forward? What do you need from them? From the situation? Instead of spending 35 minutes or more of typical RPG combat where were constantly grind each other’s Hit Points or whatever down, the Classic Traveller system lets you move on. You want these sad sacks dead? They’re dead. There. You did it. Tossing dice back and forth till one side finally drops isn’t interesting. What’s interesting is the fallout from the death. Or imprisoning them after you get them to surrender. Or negotiating with them after you don’t kill them. Or whatever. After all why spend a lot of time going back and forth rolling dice when ultimately one side is going to loose or not. Let’s get to that. And then see, based on the choices the PCs made, what the fallout is. Because for me, that’s where (along with clever ideas and tactics and the genuine need to come up with plans for survival as describe above) things get interesting. I know that may not be what some people focus on. But I’m talking about what’s in the rules as applied. I completely understand someone might want something else. In Classic Traveller the throw required for doing effective damage with a shotgun against a target in no armor at short range is 2 or better, while the same weapon used at the same range against someone wearing mesh is 8 or better. The issue isn’t whether or not the attacker hits the target in either case (the odds of hitting the target with shotgun pellets would presumably be the same in either case). The issue is whether or not the attack does effective damage to the target. This means that in Classic Traveller a failed combat throw doesn’t necessarily mean the bullet did not strike the target. The bullet might well have struck the target but the armor protected the character, or the bullet only did a grazing blow, and so on. When a weapon used at a certain range against a target wearing a certain kind of armor gets an automatic success it means that that a trained man or women firing the weapon will manage to not only hit but hit effectively. An important point from this: Long weapons are dramatically less effective at Close range. If you can manage to close on an assailant with a rifle, shotgun, carbine, or submachine gun and engage him in hand-to-hand or melee combat you drop his odds of doing effective damage with his firearms than they are at Short or Medium range. I’m not saying it is easy to close on an assailant armed with a long weapon. I’m not saying it’s safe. But if you can come up with a clever scheme (see above) to distract the assailant or otherwise approach the assailant from a direction that isn’t straight toward a blast from his weapon you’ll stand much better odds of survival in the long run. With the First Blood rules the character may or may not die when effective damage is applied. The Damage dice might be enough to drive the three physical characteristic to 0… or not. It’s a random roll. If the Player Character has STR 8, DEX 5, and END 7 and an attacker automatically hits with 3D6 for 11 points of damage the character will be wounded… but not dead. And this is where traveling with people you can count on comes in. You might get shot at. Someone might get hit and suffer wounds or be knocked unconscious. But as long as you’ve got other people at your back you might come out of this alive. A party with surprise can try to avoid the encounter before it takes place. A party with surprise gets a free rounds of attacks before the enemy can counter attack. (And if they can do so without raising alarms of any kind they keep their surprise and can do it again.) A party that is under attack can try to escape the conflict. These are important parts of the game to keep in mind because they remind us the personal combat system isn’t about two lines of people standing in an open field shooting at each other. The elements of Surprise and Range expand the fictional details we can focus on: sneaking, shelter, terrain, maneuvering for silent attacks, and so on. All of these element can downgrade or eliminate the threat of automatically taking shotgun pellets to the gut even if one is unarmored. Keep in mind that the Surprise roll and DMs are based on a particular circumstance–two parties being either aware of potential danger or both unaware and about to bump into each other. But if one side or another has set up an ambush, for example, they might get extra DMs in their favor. Thus, if the Players/PCs are clever (see above) and set up circumstances in their favor with roleplaying and tactics, the Referee might hand them them surprise over their opponents. All of this seems not only perfectly reasonable, but awesome, to me. If you wish you can check out the Weapon Cards I created that combine the distance and armor matrixes weapon by weapon, and it offer a clear view on the odds per weapon. Here is the post Notes on the Personal Combat System (I). In this post I quoted in full a passage from The Traveller Adventure, which describes how to handle Situation Throws in Classic Traveller. I’m following up with a few more posts addressing specific portions of that passage. None of this is any sort of declaration about how people are “supposed” to play the game. This is my approach, based my thinking after digging into the original Traveller rules. Situation Throws: In the absence of any other guidance, the referee may always resort to the situation throw. When an incident first occurs, throw two dice to determine its relative severity. A low roll means that it is easy, a high roll means comparative difficulty. The number achieved is now the situation number. The player characters involved, when they attempt to deal with the situation, must roll the situation number or higher on two dice. Now, this is fascinating to me for several reasons. The text suggests that if you don’t know what the difficulty should be for a Throw, you should generate the Throw randomly. I think this is brilliant. First, it relieves the Referee of the burden of determining how hard something is. After all, if a fictional airlock gets stuck on a fictional ship during the circumstances of a fictional starship battle, how hard would it be to force that airlock open? Do you know? I know I don’t know. We don’t have enough information–and we never will–to truly know exactly what forces, what damage, what materials, and so and so on should factor into the difficulty of forcing the door open. Many RPGs use a mechanic where the Referee must determine the difficulty of a task. Examples include Burning Wheel, MegaTraveller, HeroQuest and so many games it wouldn’t be worth trying to name any more. And yet, despite it being a common feature in RPG design, when I’m asked to apply it such rule rubs me the wrong way. Especially in a game like Traveller which assumes a certain level of technical level-headedness and a sense that physics and science as we know them will apply. But, again, even if everyone at the game table was a MIT doctoral candidate, there’s no way to know how difficult certain things are going to be since the reality of the situation cannot be tested and measured. So, for this one reason I love this idea of randomly rolling to determine the Throw required for success. As I’ve written here, here, and here I think the role of the Referee in Classic Traveller is that of an impartial adjudicator of actions and choices of the Player Characters, and the cause-and-effect results on the fictional world around the Player Character and the reaction of that world back at the Player Characters. In such a style of play I am not trying to lead the characters toward any sort of result, I am not trying to stymie their efforts with any agenda on my part, I have not plot I am trying to steer them toward. But here’s the thing: As a Referee I might set the difficulty high for a roll if I want the Player Characters to fail. Or might set the difficulty low if that leads the path I want the Player Characters to follow. In either case I am not being an impartial adjudicator, but using the rules to nudge the players to certain results, choices, or actions. But since I want to Referee Traveller as an impartial adjudicator, I don’t need a tool like that. In fact, what I really need is an impartial method of determining difficulty when I have no other information or rules to fall back on. And this method–rolling 2D6 to randomly determine the difficulty of a Throw offers me exactly this. This doesn’t mean the Referee has no say in the relative value of a Throw’s difficulty. For example, if the situation seems like it should be difficult or challenging the Referee can choose to roll D6+6 rather than the default bell curve of 2D6. The passage above in The Traveller Adventure continues on with more interesting ideas. It is even possible for a referee to make the situation number greater than 12, thus making success impossible unless the players can provide necessary skills or tools with DMs to get their throw also above 12. So the Referee could choose to roll D6+8 for a Throw’s difficulty (providing a range of 9-14 for the Throw) or any other weighted roll he wishes. In other case the Referee is not deciding how difficult the situation at hand will be. Even if he weights the roll (which he should do if he has a sense of whether the situation is relatively easy or hard) the actual result is still random and impartial. Rolls by the referee may be kept secret, or partially concealed depending on their effects. In situations where the players would not actually know the results of the roll, or would not know the exact roll made, the referee would make the roll in secret. Die rolls may be performed either secretly, by the referee, or openly, by the players. Sometimes, the adventure of the scenario is reflected in the die rolling and the characters really need to be able to throw the dice themselves. Other times, the referee and the scenario are better served if the players are not aware of the exact rolls to be made. Sometimes the purpose or even the existence of die rolls should be concealed. An important principle to remember is that die roils should not be allowed to get in the way of the game. If the players are thinking about their die rolls rather than about what is “really happening” in the game, the referee should consider increasing the number of secret die rolls. Open Die Rolls: The referee should generally allow the players to perform their own combat die rolls and rolls for other simple actions in which success or failure is immediately visible. Secret Die Rolls: The referee should keep secret all die rolls whose outcomes are not immediately visible and those whose chances of success, if known, would reveal things the characters should not know. For example, the referee should perform all rolls if the characters are gambling at a casino, in order to allow the possibility of the house having rigged the tables. I think this is a useful tool for the Referee to keep in mind when using the rules mentioned above. Thus, if the Player Character with Engineering wants to force the airlock and the Referee decides to randomly determine the difficulty, he might have the Player roll one D6 and he himself roll the second D6 in secret. In this way the Player Character might end upon with a sense of difficult the situation is. In other cases the Referee might want to keep the Throw value a secret. And in other situations again the Referee might want to present the difficulty of the Throw. I personally prefer to let the Players know the odds of a situation. This helps the process of making a decision more interesting in my view. More information means their decisions are more meaningful, whereas decisions without information are merely guesses. But I think there is something value in this approach of keeping rolls or portions of rolls secret and it is something I want to think about. That said there are plenty of times where the Players don’t need to know at all about what is being rolled and keeping those rolls a secret will definitely help the Players stay in the fictional space of the game. A few things became clear reading the rules. First, there is a reason Traveller’s starship movement is vector based and has templates for gravity wells around worlds. Marc Miller really likes vector based movement and gravity wells! If you look at his game Triplanetary, you’ll see an entire game built around using vector based movement for racing and battling in space. The game came out 4 years before the original Traveller rules. Then, in the following years, Miller writes Traveller and uses the focus found in Triplanetary to create the movement and combat found in Book 2. Then, a year later, he takes the ships and details from Book 2 and basically uses the core concepts of Triplanetary to create a new board game as part of the Traveller line. Once you look at all three games at the same time you simply see the pattern! But to more much practical details became clear when reading the Mayday rules. For years I have been baffled by two elements of ship-to-ship combat in Traveller. First, how do missiles move? Second, how do the clouds of sand from the sandcasters move? The rules do not say (not in the 1977 edition, not in the 1981 edition, not in The Traveller Book, not in Starter Traveller). And these two components are really important to space combat! But if you open up the rules to Mayday all becomes clear. In part because Mayday is a stripped down, simplified version of Traveller space combat. It is designed as a board game, not a miniature war game. And I believe Miller made sure that the language and explanations of the rulebook would be easy to understand for the more casual gamer. Missile movement is defined by its propulsion system. The propulsion system is defined by two numbers, commonly separated by a capital G. The first number is the maximum number of Gs which the missile is capable of in a turn; the second is the number of G-burns of fuel the missile can make at maximum G.
For example, a 1G1 propulsion system can accelerate a maximum of 1G per turn, and is capable of burning fuel to achieve 1G once. A 6G6 system can accelerate to a maximum of 6G per turn, and has enough fuel to reach 6G six times. A 3G3 system can accelerate to a maximum of 3G in one turn, and has fuel to allow reaching 3G for three turns. Special Supplement 3: Missiles explains all this. But I have to say, reading it in Mayday finally made it click. Of particular note: Both Mayday and Special Supplement 3: Missiles create templates for different kinds of missiles, with different sorts of propulsion, guidance, detonation systems and more. As a general rule Special Supplement 3: Missiles states, “the standard missile in Traveller is a 5G6 continuous burn.” This mean that missiles in Traveller have a 5G thrust available per turn, that they can accelerate up to 5G six times before running out of fuel, and that they will keep moving toward their target as efficiently as possible until fuel runs out. There are other factors one can apply from the rules based on various types of missiles and build. But that previous paragraph is enough to allow you to use the missiles in Book 2 as written. Ships equipped with sandcasters may launch clouds of obscuring crystals (sand) which interfere with laser fire and small weapons such as missiles. Sand may be launched in the ordnance launch phase, provided that the missiles are not launched from the ship in that phase. The launch program must be running in the computer for the sand to be hunched. Mark the present position counter of the launching ship with a blank white counter. For as long as the ship does not change course, the counter remains in place, indicating that a cloud of sand surrounds the ship. So, as long as the ship does not change vector the sand provides cover. If the ship changes vector, the ship ends up in one place and the sand keeps going the way it was. Easy-peasy! But again, never defined in the Book 2 rules. Situation Throws: In the absence of any other guidance, the referee may always resort to the situation throw. When an incident first occurs, throw two dice to determine its relative severity. A low roll means that it is easy, a high roll means comparative difficulty. The number achieved is now the situation number. The player characters involved, when they attempt to deal with the situation, must roll the situation number or higher on two dice. They are, of course, allowed DMs based on any appropriate skills. Tools, assistance, and equipment may also provide beneficial DMs; weather, haste, adverse environment, or other handicaps may impose negative DMs. It is even possible for a referee to make the situation number greater than 12, thus making success impossible unless the players can provide necessary skills or tools with DMs to get their throw also above 12. The text assumes that there will be plenty of times when a Throw is not required. This is something I addressed in this post, in which I posit that the RPG play of the early years of the hobby (essentially the 1970s) expected a strong Referee to make adjurations without the need for constant die rolling or reference to rules. Throws were required when the Referee isn’t sure how a situation should play out. If the Referee believes he has enough information to adjudicate the situation based on the fictional elements at hand he simply makes the call and there is no need for a roll. For example, if a Player Character is sneaking up on an encampment to steal some documents. His companions are firing at the camp from a position from a nearby ridge. The NPCs in the camp are distracted by the gunfire and are returning fire. The question is: The players have cleverly provided a distraction for the Player Character sneaking into the camp; the NPCs are fully engaged in the firefight and assume the opposition is at a distance and not about to sneak into their camp. Does the Player Character sneaking into the camp need to make a Situation Throw to get into the camp undiscovered? After all, the Referee could decide that the distraction draws enough attention that no will notice the Player Character if he is moving in a particularly stealthy manner. The Referee could also have the Player make situation throw at very good odds. For example, “Given the gunfire from up the ridge that is distracting everyone, you’ve got a good shot to make it into the camp without being noticed if you move really fast. Make a roll of 4 or better and you’re safe.” In this example, the distraction is definitely working. Bu the roll acknowledges someone might look back or around the camp to see if other enemies are nearby. Throw 10+ per day of repair attempt with DM +Engineering skill of the attending engineers to fix them temporarily. More complete repairs must be made at a starport by qualified personnel. So, someone with Engineering can jury-rig repairs on damage starship components until the ship can reach port. But a “more complete repair” requires personal and equipment at a starport. But which starports will have such facilities? Starport Type A Excellent quality installation. Refined fuel available. Annual maintenance overhaul available. Shipyard capable of constructing starships and non-starships present. Naval base and/or scout base may be present. Starport Type B Good quality installation. Refined fuel available. Annual maintenance overhaul available. Shipyard capable of constructing non-starships present. Naval base and/or scout base may be present. Starport Type C Routine quality installation. Only unrefined fuel available. Reasonable repair facilities present. Scout base may be present. Starport Type D Poor quality installation. Only unrefined fuel available. No repair or shipyard facilities present. Scout base may be present. Starport Type E Frontier installation. Essentially a marked spot of bedrock with no fuel, facilities, or bases present. Starport Type X No starport. No provision is made for any ship landings. Given these descriptions, the Referee can assume quickly that given standard situations, Type A and B starports will be able to handle repairs to damaged drives on a starship, and Types D, E, and X will not. Given standard situations, the Referee doesn’t have to make a roll of any sort to see if repairs on the starship can be made. Clearly, at Types A or B the repairs can be made, and a Types D, E, and X there is no chance the repairs can be made. But what of Type C? The description states: “Reasonable repair facilities present,” which clearly defines it as different in quality than Types A and B, but still being able to do repairs. Does such a facility have what the PCs’ ship needs for repairs? Or is there a chance the starport might be lacking the specific equipment or personal to repair the ship drives? Further, if the PCs have already traveled to a particular Type C starport and the Referee had already established it is a very well-stocked starport with a capable repair staff, then the PCs would have every reason to expect that they would easily get the repairs. But let us say that the Referee doesn’t have such situations noted about the planet or starport that might lead him to think no roll is required. He might simply have the notation: “Type C starport” and no more. Will such a facility be ready to handle repairs on damaged drives? At this point the Referee might decide, lacking “any other guidance,” that a Throw is required. The first roll might simply be to determine the odds of such equipment being available. He might say, “On a Throw of 8 or better the facility can handle the repairs.” Or he might decide, “Yes, the facility can handle the repairs, but the resources are tight. The PCs will have to make Situation Throws to get ahead on a waiting list or get equipment needed for repairs diverted to their ship.” Such rolls might involve DMs from skills such as Admin, Bribery, and so on. The situation can get complicated even for a Type A starport. Let us say that the Referee has established that a world with a Type A starport is at war with another world and acts of sabotage have been committed against the starport. The facility is damaged, perhaps even downgraded to a Type B starport for the time being. In such circumstances, what repairs the starport can make might shift week to week. In this cases, once again, the Referee can either make an adjudication on the fly. Or he can make a roll on his own to determine if such equipment is readily available. Or he can put the PCs in the position of struggling with actions and situation throws to find their way forward. Examples of cases where the Referee might or might not decide a roll is not required, or be uncertain if a roll is required, are endless. The point is that a roll is not required for every action or every situation. The game actually can move along quite well without lots of rolls, with the fictional details created by the Referee and the Players providing enough context for the Referee to adjudicate on the fly. Where the Situation Throws come into play is when the Referee doesn’t have enough guidance to make a call off the top of his head. (“Would someone look back as this firefight starts and notice the Player Character sneaking into the camp?”). If he’s not sure what the call would be, the Referee asks for the Player to make a Situation Throw. I really, strongly, disagree with this sentiment, though I can see why some people might think it. So here’s post about it. Traveller, at least as originally written, was never about Hard Science Fiction as we know it today. It was about ADVENTURE. It was inspired by the works like the Dumarest series by E.C. Tubb, the Demon Princes series by Jack Vance, the Nicholas van Rijn tales by Poul Anderson, among other SF tales from the 40s to the 70s. That Traveller could become a playground for gearheads has nothing to with what it has to be. If you go read the Dumarest books or the Demon Prince books you see tales of adventure in an SF setting… but the focus is not calculating heat exhaust issues, but on skullduggery, theft, assassination, political corruption, fighting abusive power, protecting the weak, revenge, ambition, and more. The point of the “science fiction” element is to put these tales in the context of exotic setting with strange creatures, alien races, and peculiar technology to heighten the novelty of the adventure and provide mysterious situations the protagonists have to deal with. The stories seldom rely on “real science”–but are self-consistent within themselves, allowing the protagonists to puzzle out anomalies and solve problems that make sense within the tale. As for translating all this to the table of a Roleplaying Game session: No one at the table will know how a Jump Drive works–which is why die rolls can be made to see if it can be fixed. This is why I think the procedures for determining Throw values in The Traveller Adventure are so interesting and valuable: The book suggests rolling 2D6 to determine the Throw value! This means the Referee is not responsible for knowing how difficult it is to repair a Jump Drive. His job is to determine a random value of difficulty and adjudicating the results of efforts on the part of the PCs. That’s not about science. That’s about adventure. What Do You Need to Play King Arthur Pendragon? The Traveller game in all forms is owned by Far Future Enterprises. Copyright 1977 - 1998 Far Future Enterprises. Traveller is a registered trademark of Far Future Enterprises. Far Future permits web sites and fanzines for this game, provided it contains this notice, that Far Future is notified, and subject to a withdrawal of permission on 90 days notice. The contents of this site are for personal, non-commercial use only. Any use of Far Future Enterprises's copyrighted material or trademarks anywhere on this web site and its files should not be viewed as a challenge to those copyrights or trademarks. In addition, any program/articles/file on this site cannot be republished or distributed without the consent of the author who contributed it.